Central Veterinary Hospital maintains a fully stocked pharmacy that allows our Doctors instant access to everything they need to provide the highest level of veterinary care to your pet immediately. 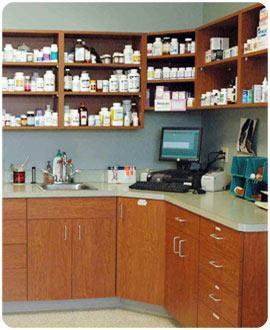 We are also able to special-order medications in palatable forms and flavors for finicky patients. Unlike on-line/discount "pharmacies" we stand behind all our products and can be reached for personal queries about the medications side effects or any problems you may encounter, six days a week. This even means speaking directly to the veterinarian prescribing it! We also monitor drug levels with routine blood tests to ensure your pet is getting appropriate therapeutic and safe levels of drugs limiting risks to internal organs.